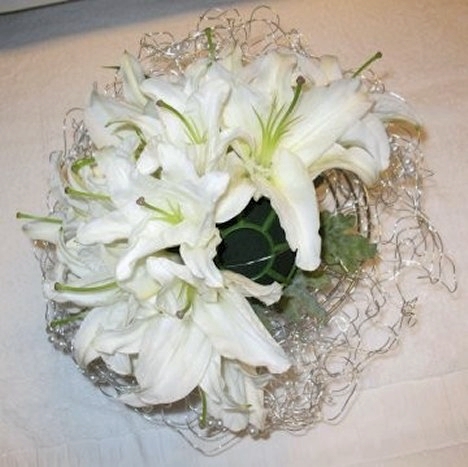 This white lily bridal bouquet is not as hard as it looks if you break it down into reasonable steps. 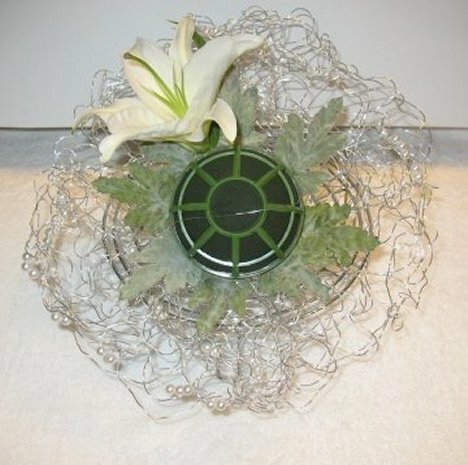 After preparing my Gala Bouquet Holder properly by soaking it in water treated with cut flower food, I attached the wire collar. 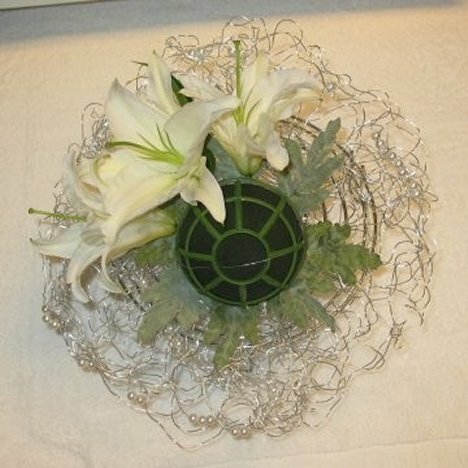 I then added a ring of silk leaves around the entire base of the bouquet holder. 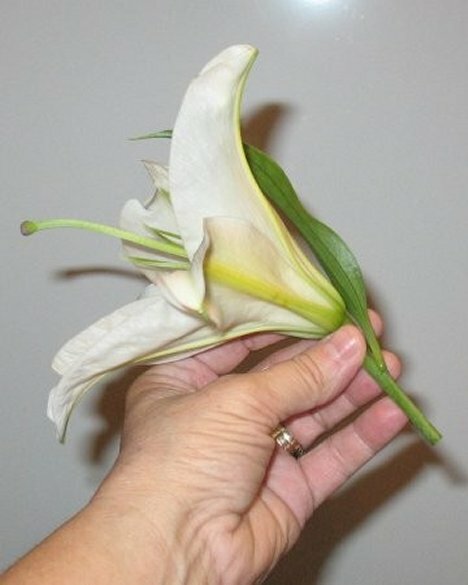 A Casa Blanca lily is a large, pure white flower with a delicious scent. It is an Oriental lily, making it much larger than the "tiger lilies" (Asiatic lilies) that you commonly see in gardens and flower beds. 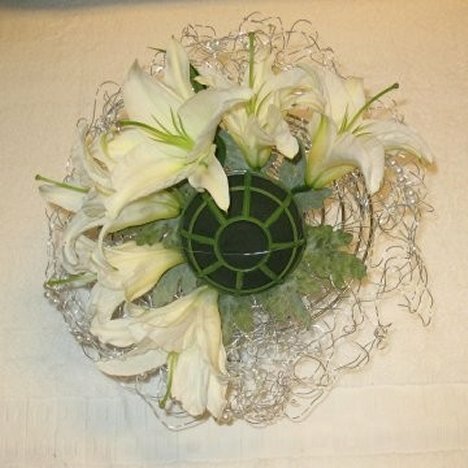 I begin the design by placing the lily deeply into the foam. Handle the flower carefully, as you don't want to split the petals off of the stem accidentally. Be sure to remove any pollen, as when it matures it will turn yellow and stain both hands and fabrics. 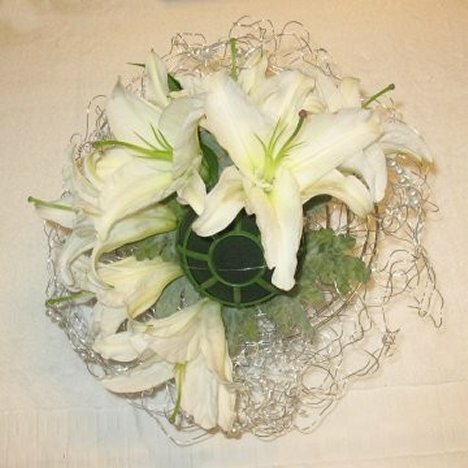 Continue to add the lilies, crowding them together so that the petals interlock, covering all mechanics of the bouquet holder. 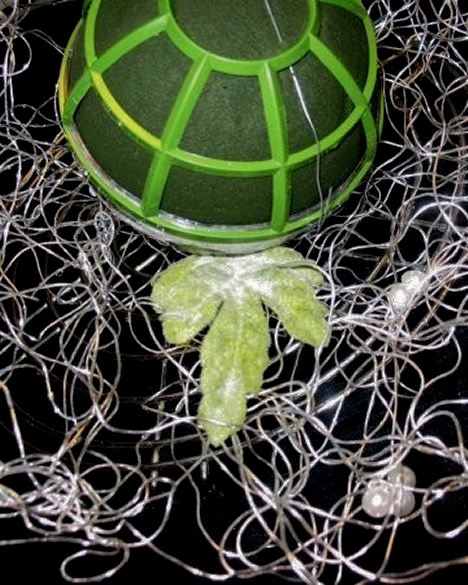 It may help to grasp the stem tightly with your thumb and index finger, working the cut end down into the foam. I'm adding flowers on the top and left side. I will leave a gap open for both hot pink Nerine Lilies and some white Cymbidium orchids. 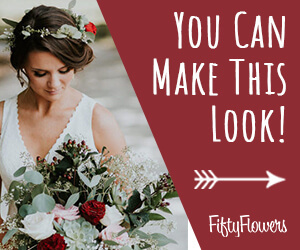 Clustering masses of flowers creates an impact of both color and texture, as you will see as the bouquet begins to take shape.